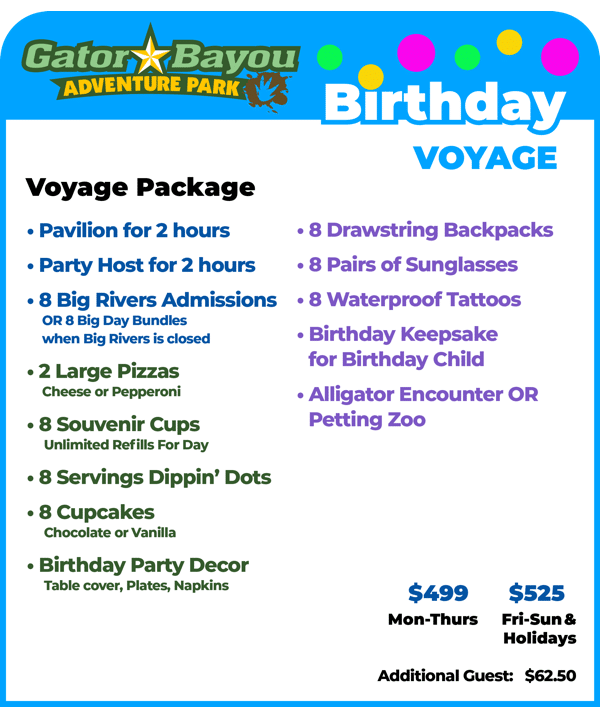 How about a birthday party at the waterpark? Or at Gator Bayou's nature center? Or near the petting zoo? 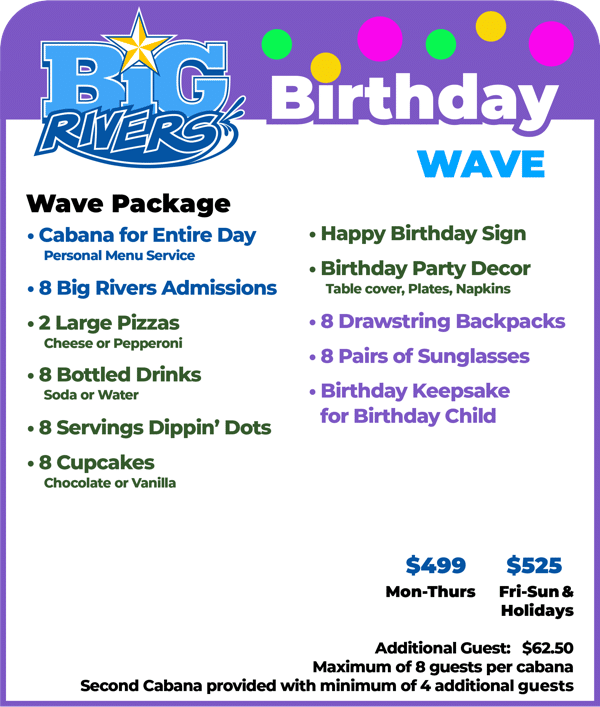 We've got some great party packages to choose from. To plan your next party, please fill out the form below and one of our team members will contact you shortly. 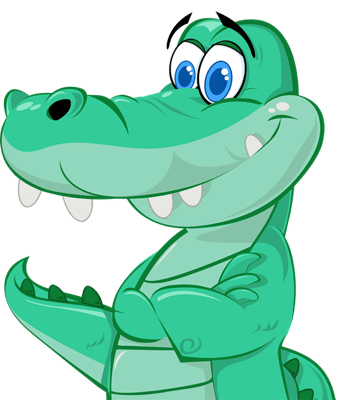 I understand that this is not a reservation, and that a reservation is not made until I have been contacted by a Big Rivers / Gator Bayou team member and details have been agreed upon. 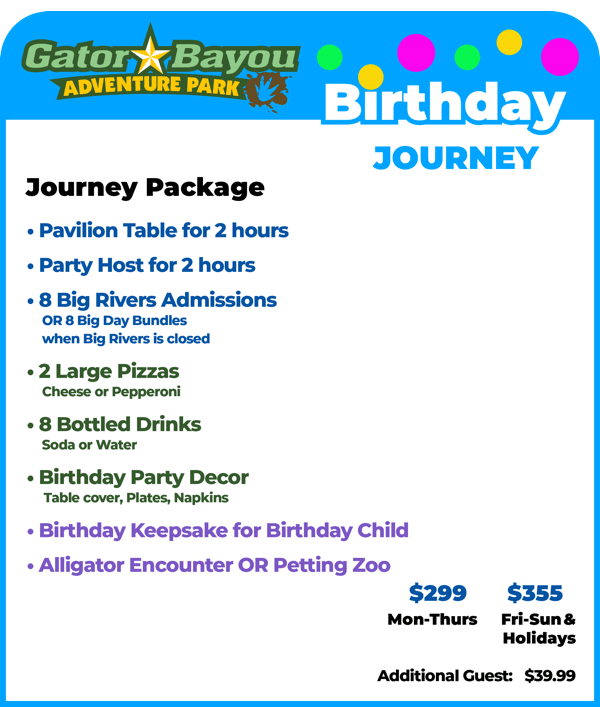 Q: If I reserve a birthday party at Big Rivers Waterpark or Gator Bayou Adventure Park, do we get admissions to both parks? A: Yes! 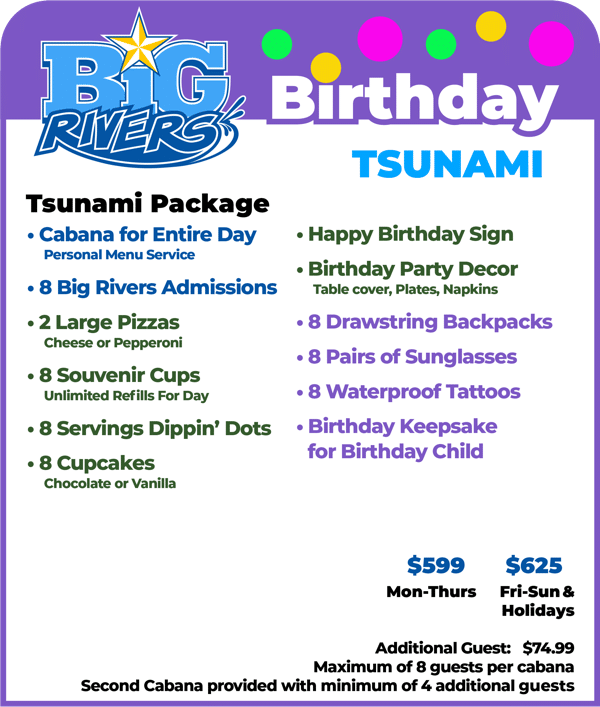 When Big Rivers is open to the public, admission to both parks is included in all birthday packages. 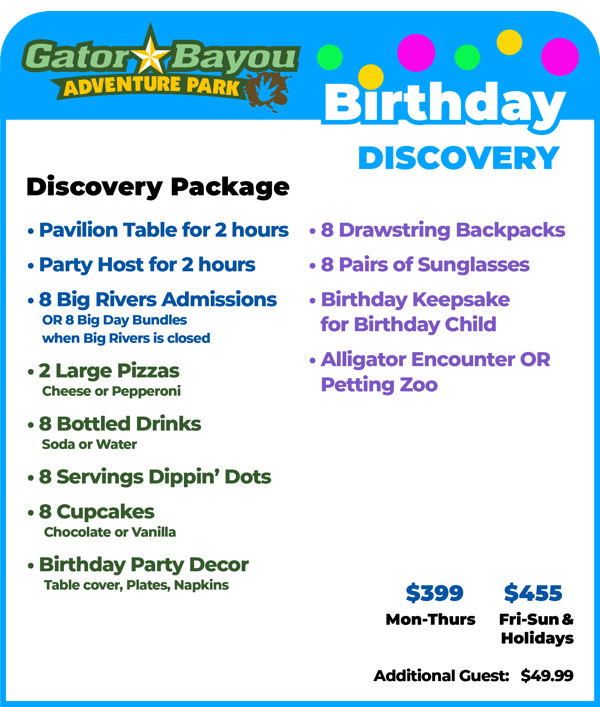 All birthday packages include access to Gator Bayou's Wild Isle, Gator Gulch, and Big Al’s Fishing: other activities at Gator Bayou are available for an additional charge. A: A non refundable $100 deposit is due at time of booking. Nonrefundable balance of party package is due one week prior to the party date. Q: Are children 2 and under free? Q: Is there a minimum number of guests required to reserve a birthday party? A: A minimum number is not required, however packages include 8 admissions. Q: Can I add to the number of guests I have invited? A: Based on availability, guests and add-ons can be included in your package at any time. It is recommended to notify us 48 hours prior to your party date of any desired changes. Q: Do parents/chaperones of children attending the birthday party require an admission ticket? A: All guests entering the park require an admission ticket. Q: Can I bring in outside food or drinks? A: No food or drinks are allowed to be brought in except for a birthday cake if you choose to bring one. Q: Does the party package cost include tax? A: Tax is not included and will be calculated and added with completed birthday party reservation and invoice. No outside food or drinks allowed except for a birthday cake if you choose to bring one. All guests require an admissions ticket whether or not they are participating in the activities. Deposit for all party packages is $100.00. The deposit is nonrefundable and must be paid at time of booking. 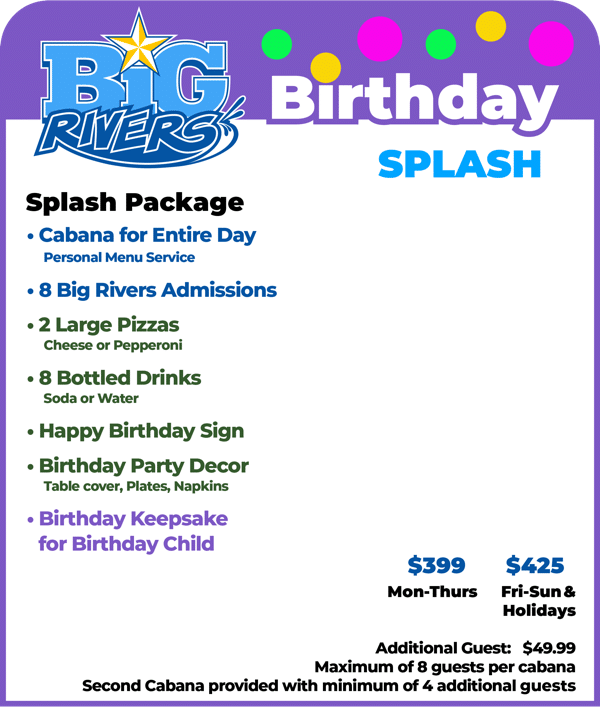 All party reservations must be paid in full 1 week prior to the party date and are non-refundable. Your reserved party time slot will be released if your party is not paid in full 1 week prior to party date. 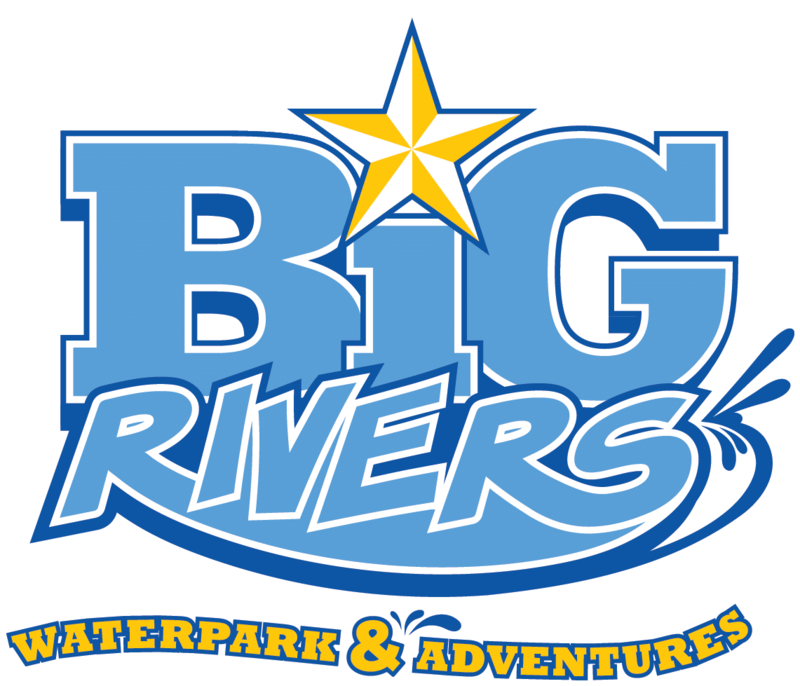 Big Rivers Waterpark or Gator Bayou Adventure Park is not responsible for any lost, stolen, or missing items throughout your stay. Based on availability additional guests, cabanas, food, and party package items can be added at any time. However it is recommended to add items at least 48 hours in advance of the party date. Ticketed activities can be purchased at anytime. A designated party host must arrive 30 minutes prior to your party guests’ arrival time in order to check in and collect your admissions tickets. We are not responsible for the distribution of admissions tickets to your party guests. If parties become separated at any time it is recommended to have a designated meeting place such as the gift shop or near the park entrance. We are unable to page lost or separated parties. Small children must be within arm’s reach of an adult at all times. Please note height and weight restrictions for all rides, attractions, and activities.